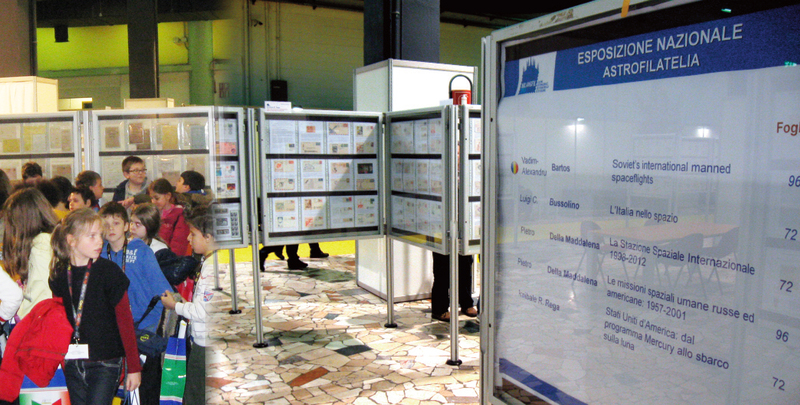 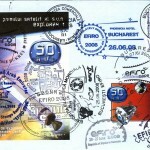 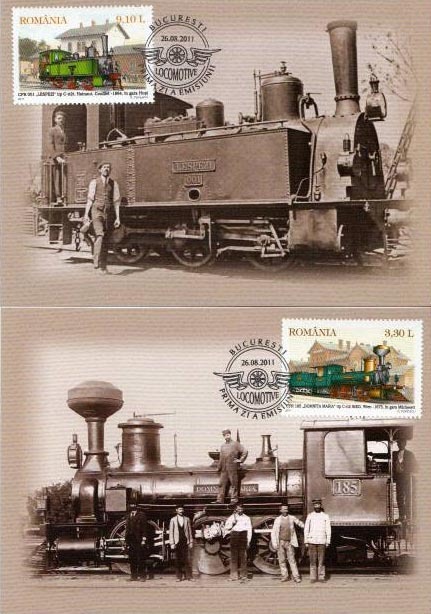 As at the end of each year, at the last meeting of the National Philatelic Commission a topic on the agenda was choosing the most beautiful postage stamps issue of 2011 and postage stamp which will represent Romania at international competitions in 2012. 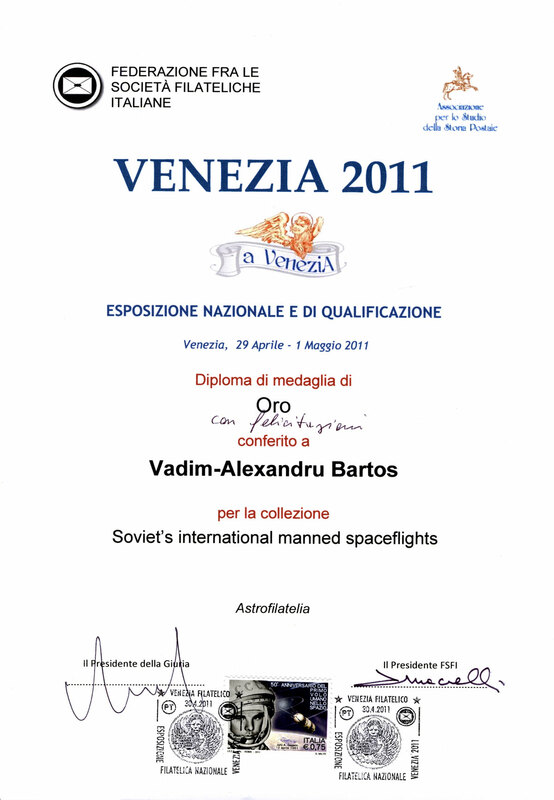 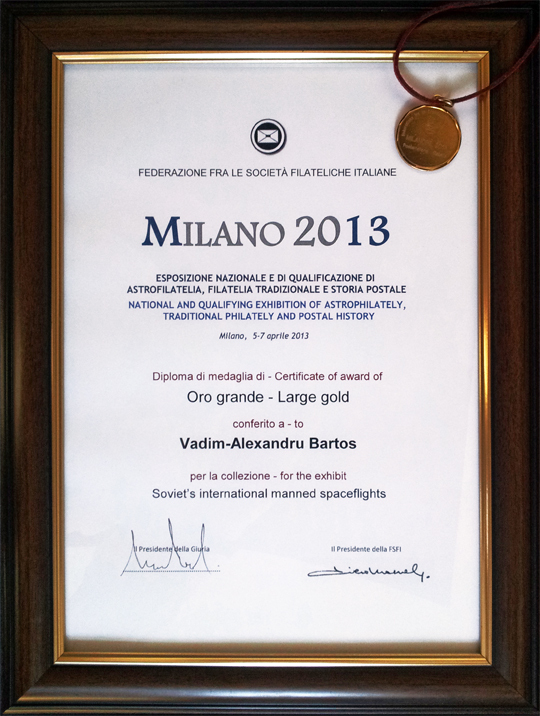 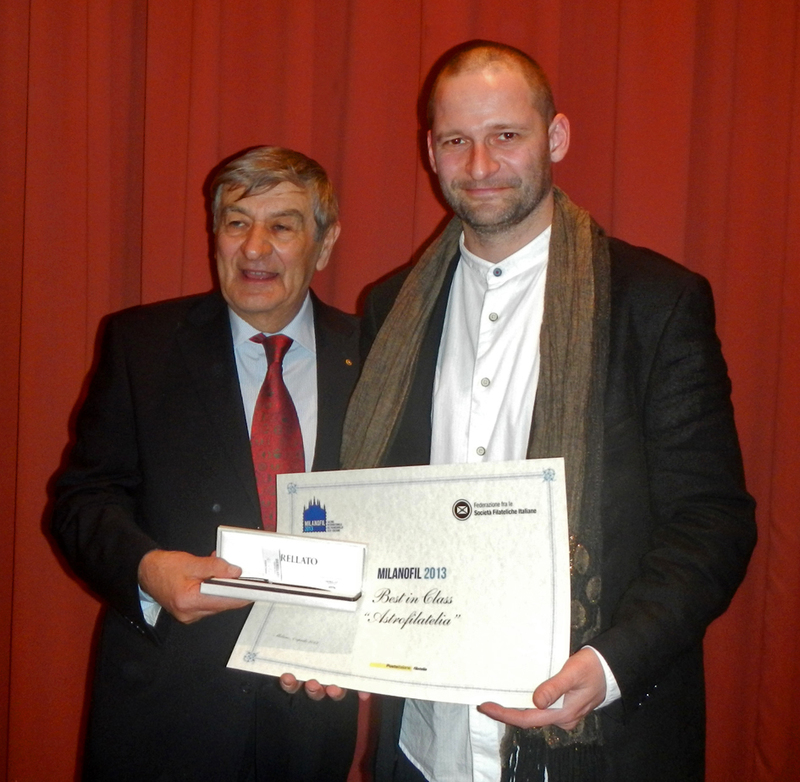 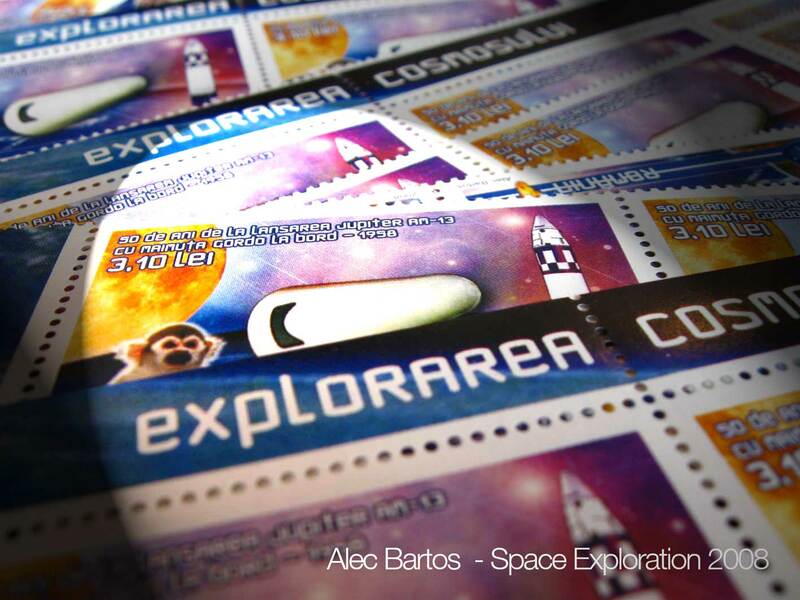 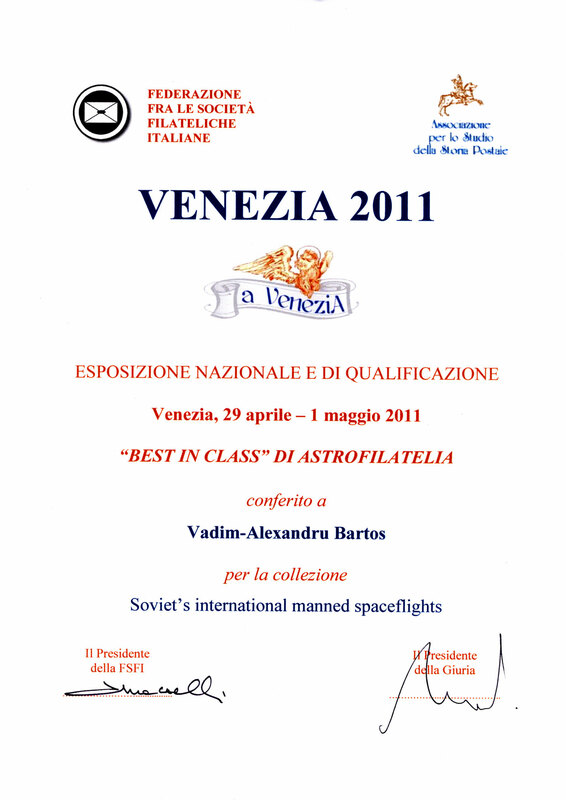 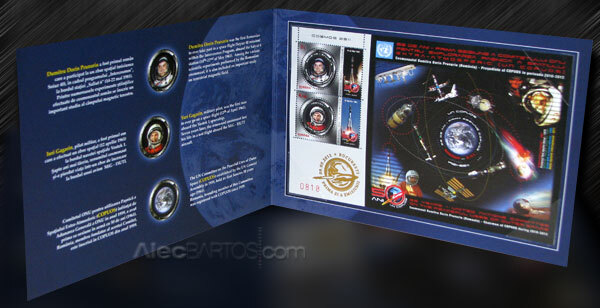 The 2nd place was awarded to Alec Bartos for his exceptional design of the “COSMOS 2011” souvenir sheet. 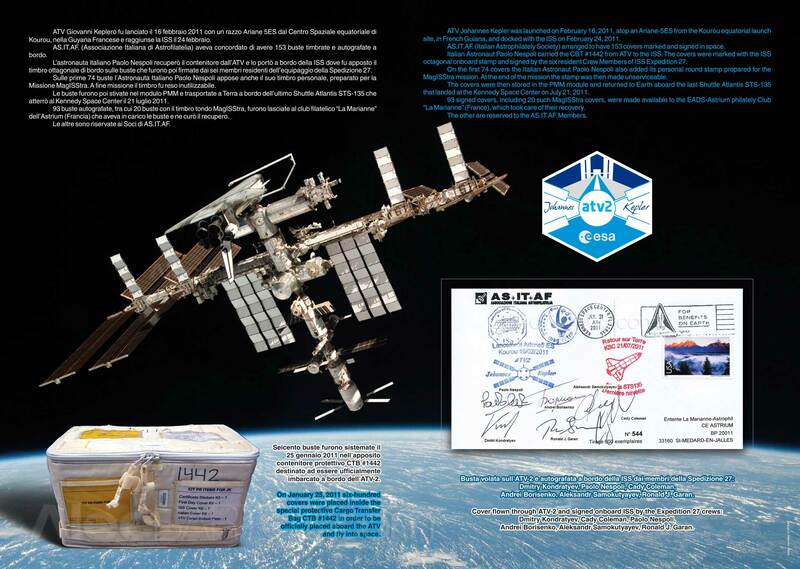 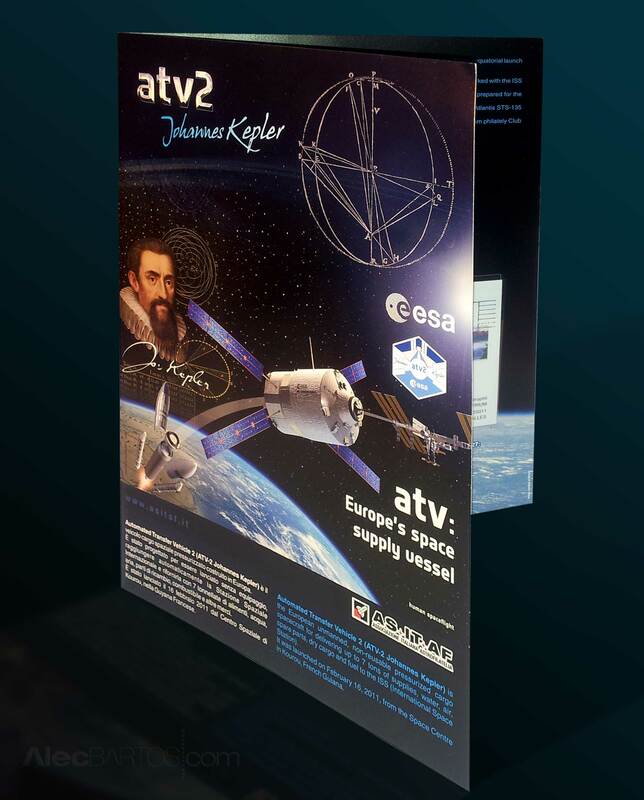 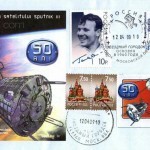 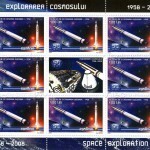 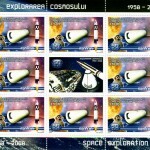 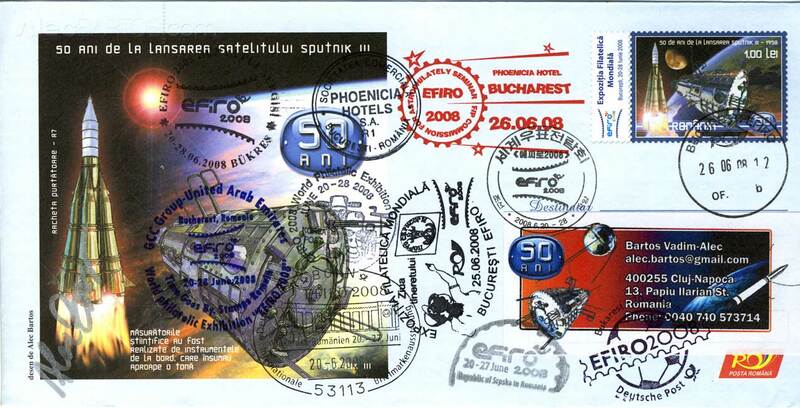 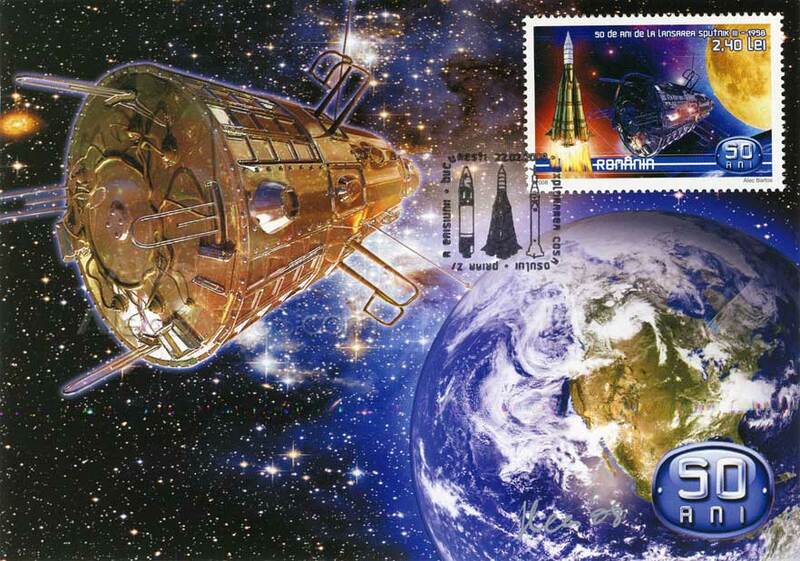 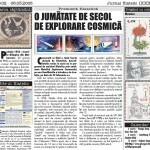 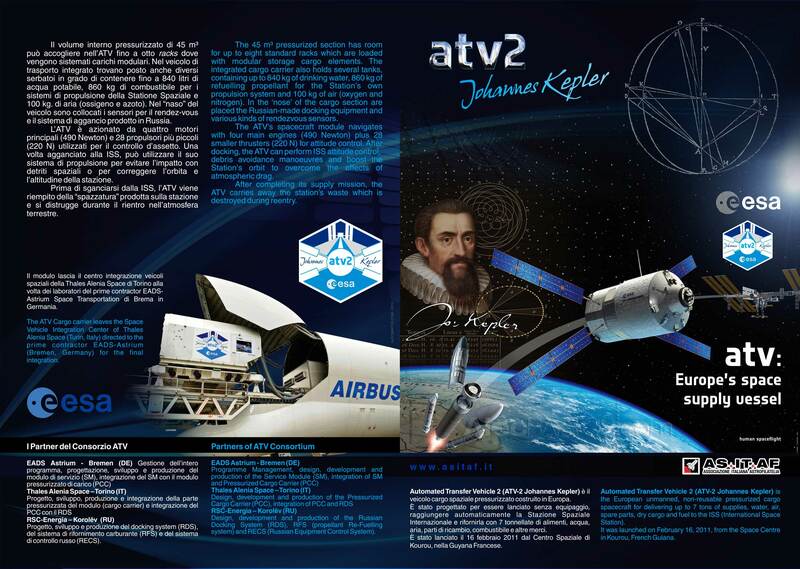 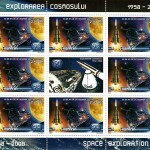 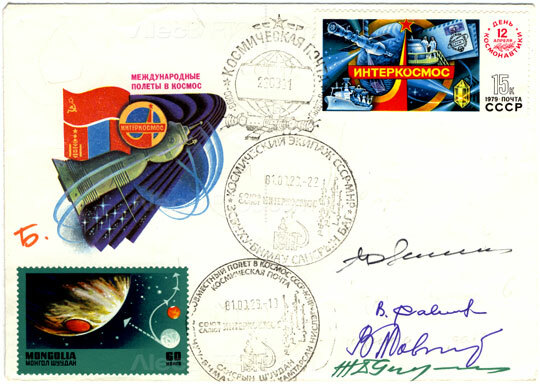 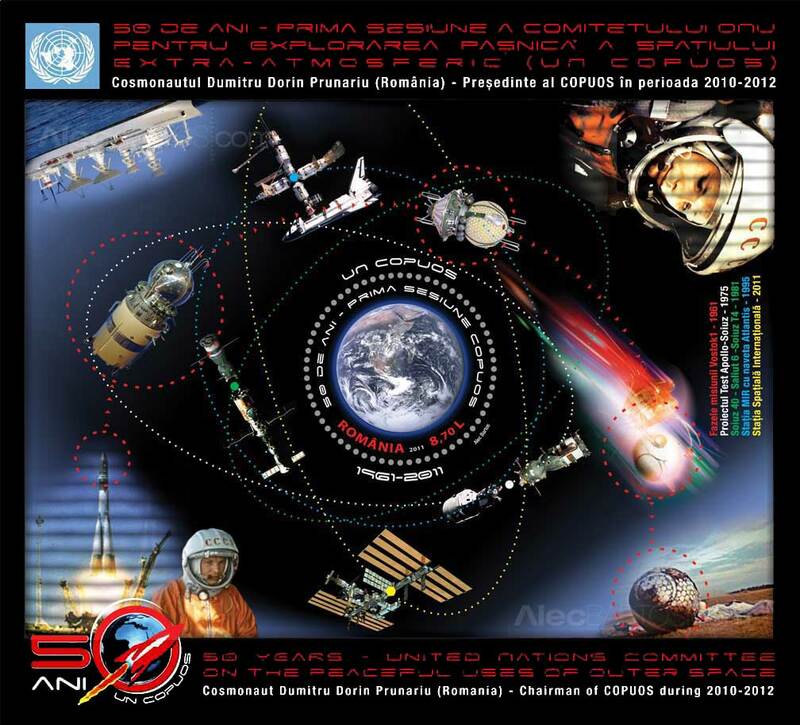 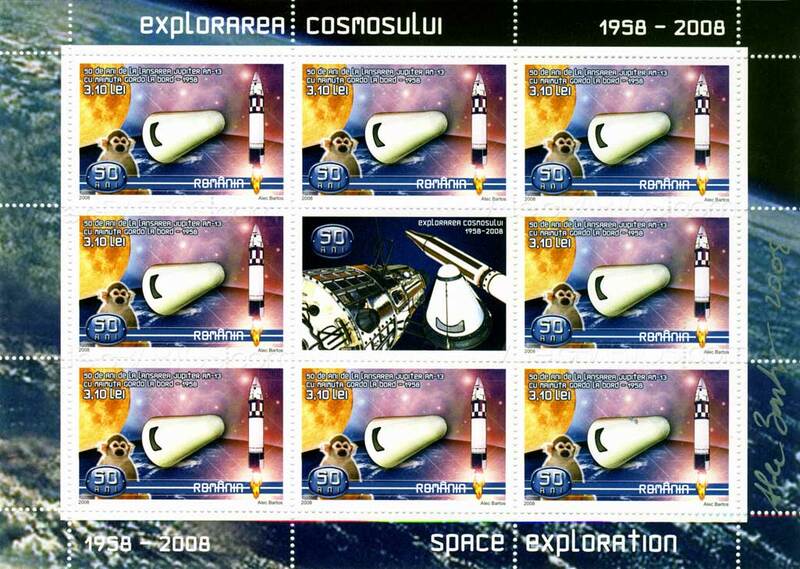 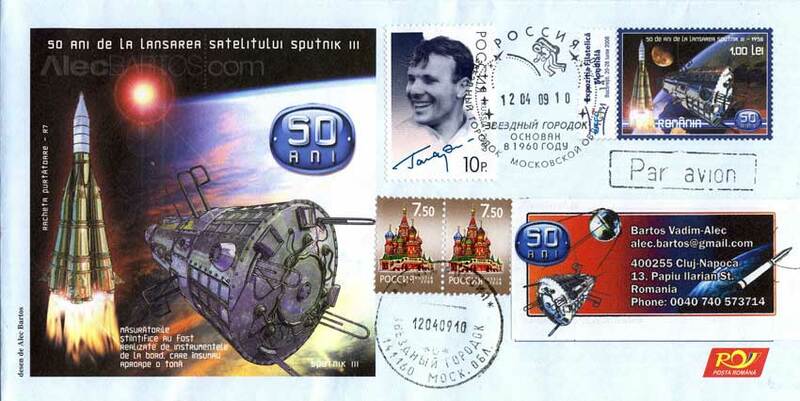 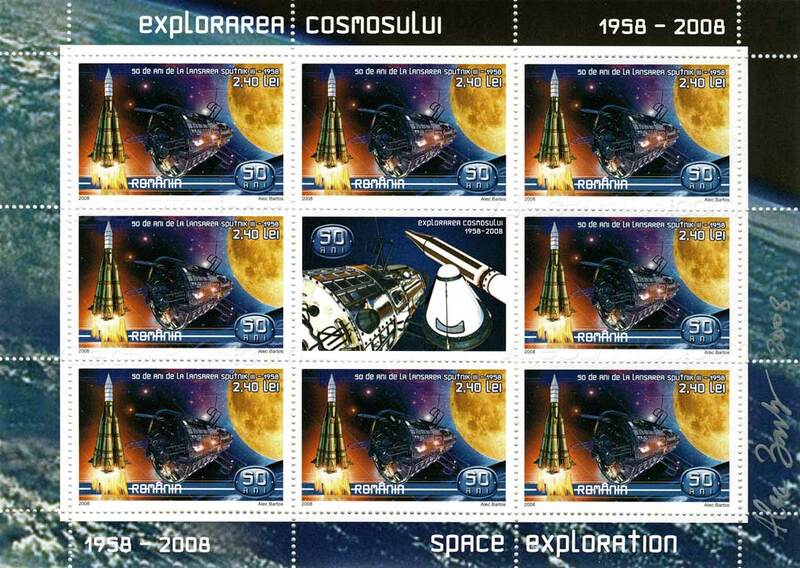 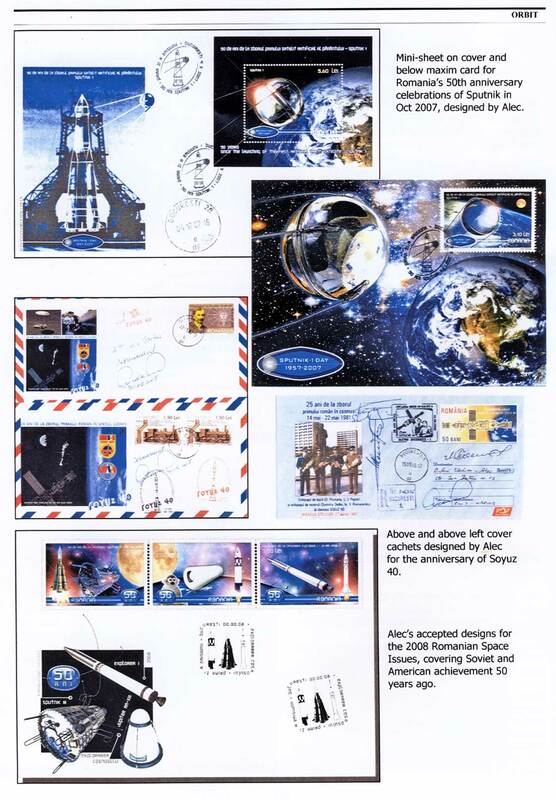 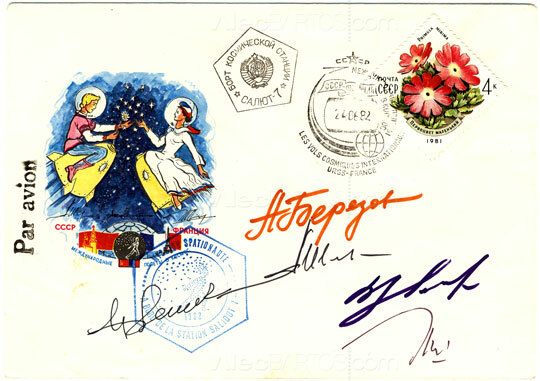 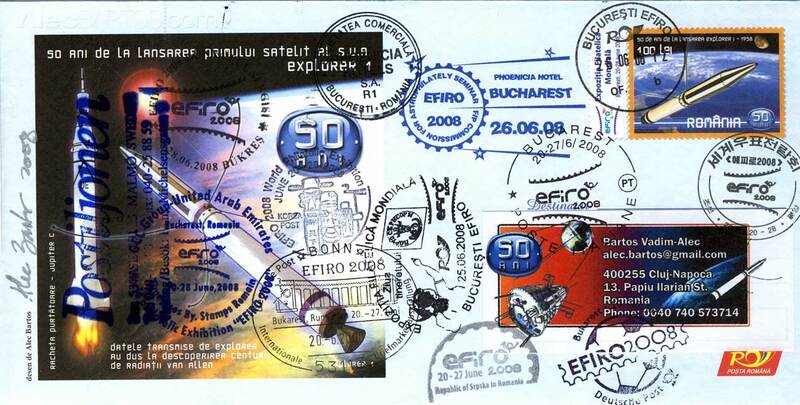 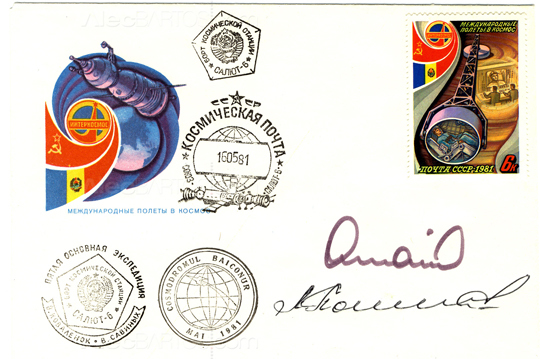 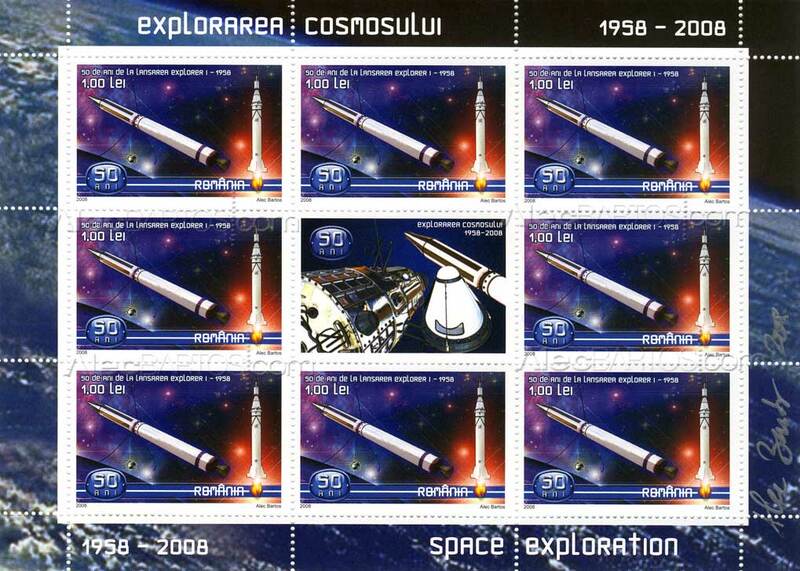 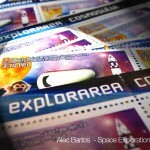 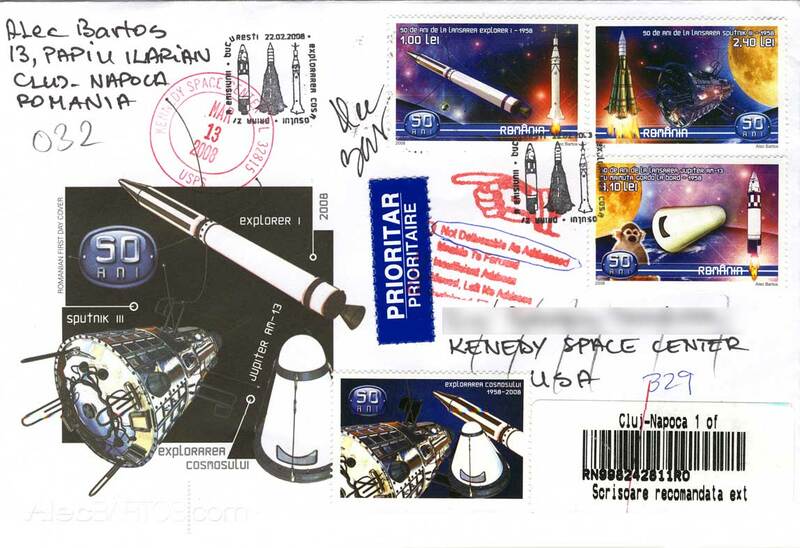 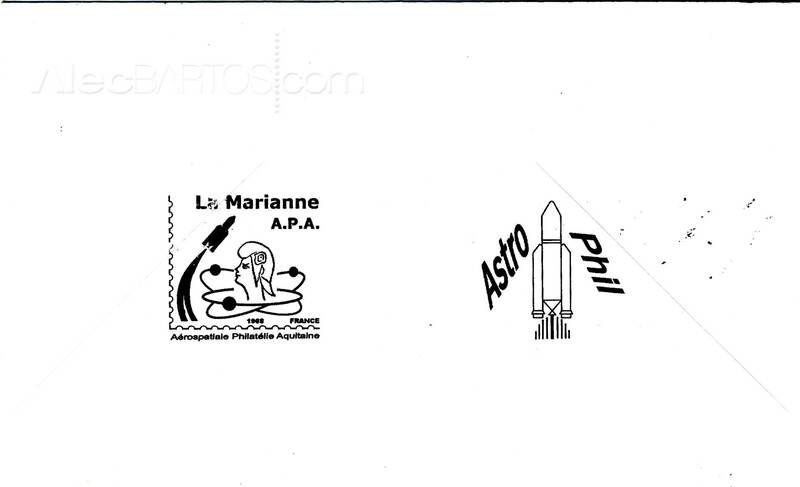 The complete “COSMOS 2011″ stamp issue – images, technical characteristics and other details here. 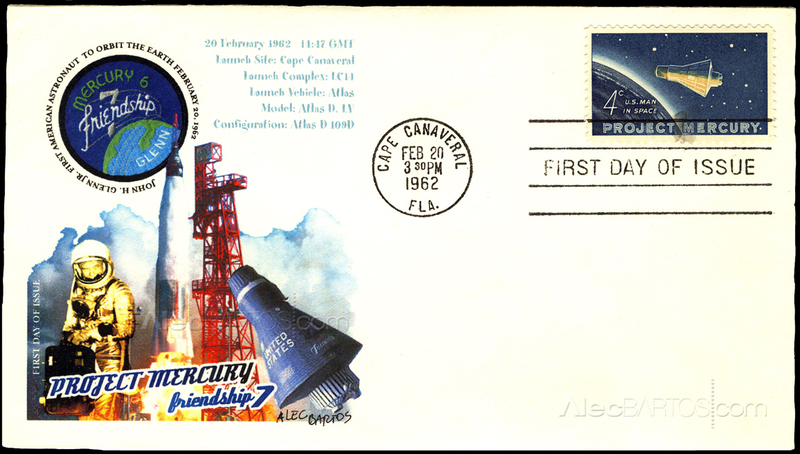 February 20, 2012– Fifty years ago Monday (Feb. 20), John Glenn, the first American to orbit the Earth, relied on ground stations located across the planet to communicate with his control team. 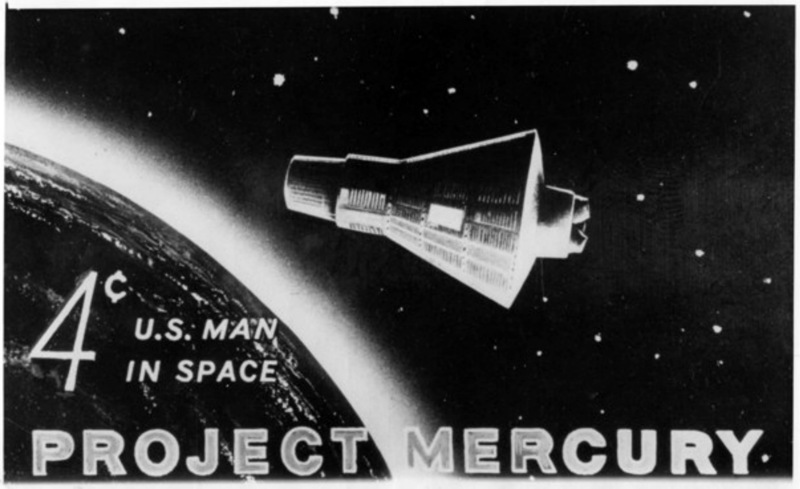 But after his Mercury spacecraft, Friendship 7, safely splashed down, it was another type of station that took over tracking his historic mission: U.S. post offices.For the first and only time in the country’s postal history, the United States Post Office Department — since 1971, the U.S. 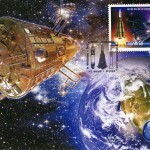 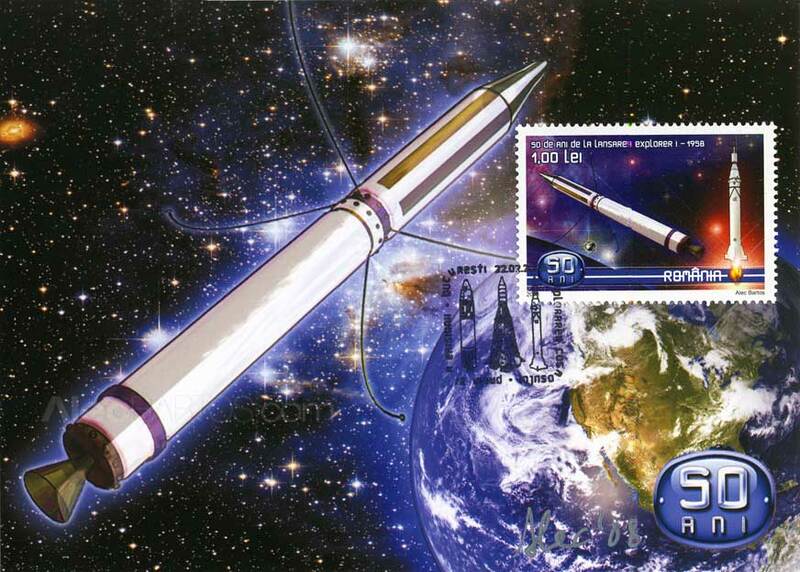 Postal Service — surprised the public with the release of a secret stamp celebrating Glenn’s successful mission. 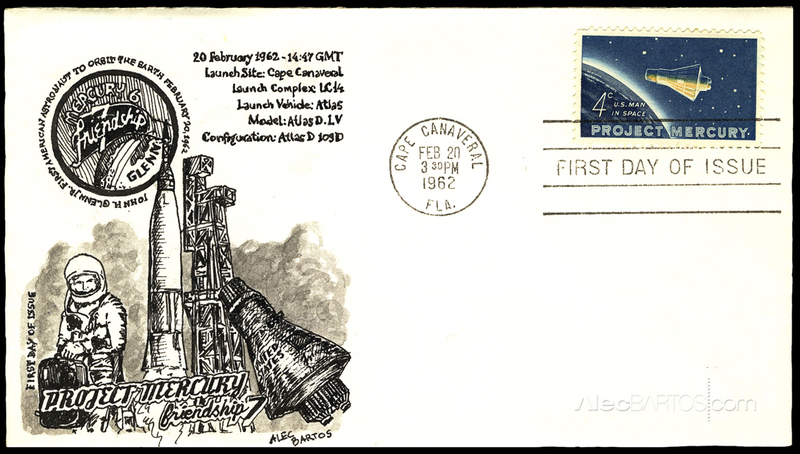 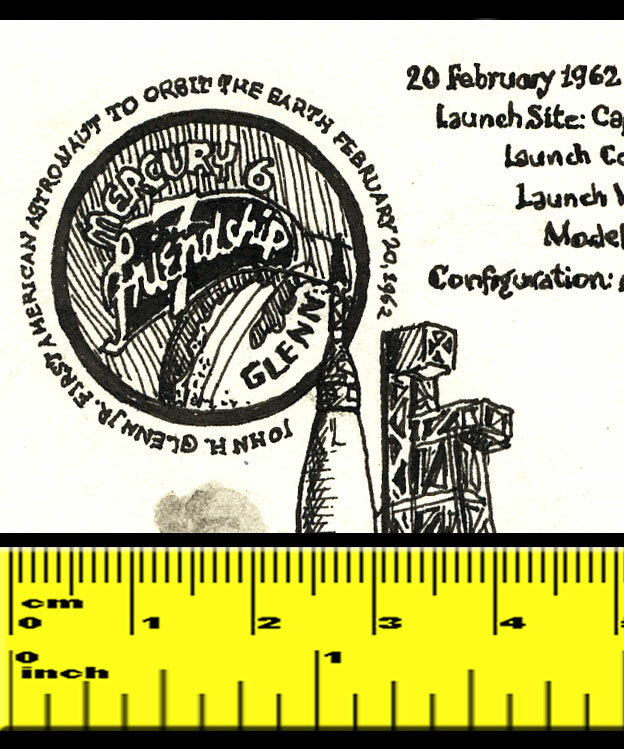 The 4-cent “Project Mercury” postage stamp was revealed and immediately put on sale in 305 post offices within an hour of Glenn’s triumphant return to Earth at 2:43 p.m. EST (1943 GMT) on Feb. 20, 1962. 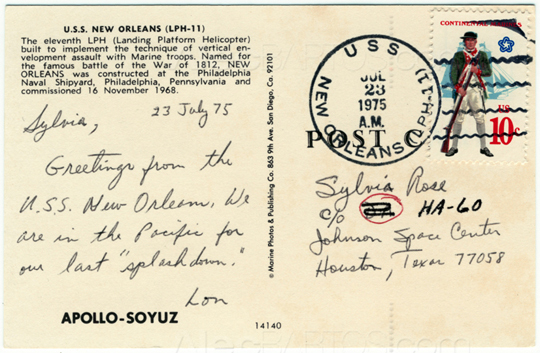 Half a century later, collectors are still searching for those first-day-of-issue stamps. 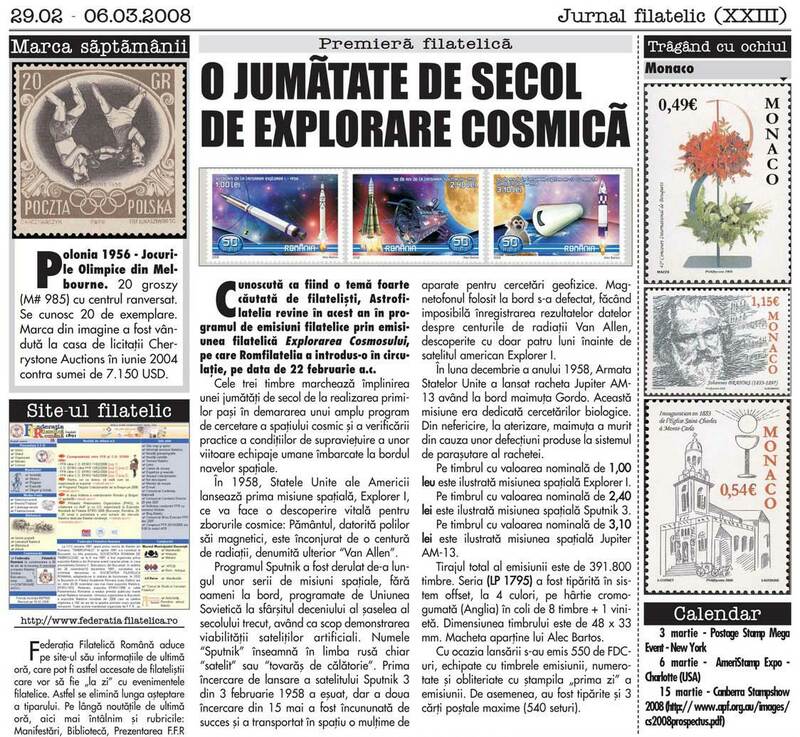 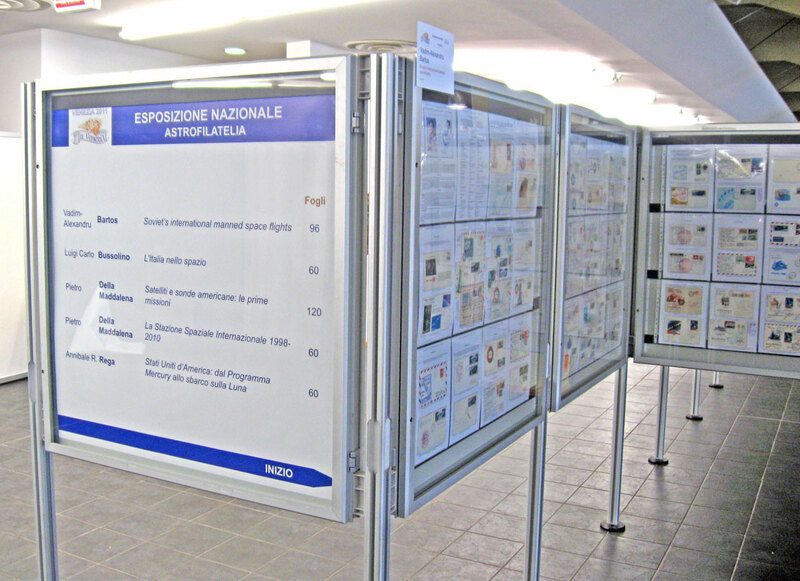 The following editorial from the January February 2011 issue of the Collectors Club (New York) Philatelist is especially important news for members receiving registered mail from foreign destinations in the USA, or to those sending registered mail to the USA. 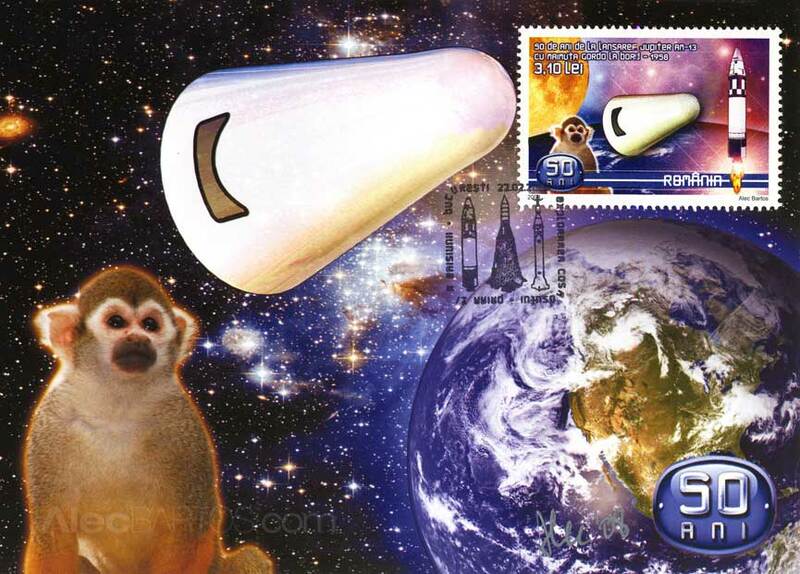 Warning to all who might receive registered mail from overseas: Inquiries by overseas senders regarding missing registered mail have discovered a disturbing problem. 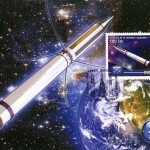 Since June 2009, all registered mail arriving in the U.S. from overseas is treated by the U.S. 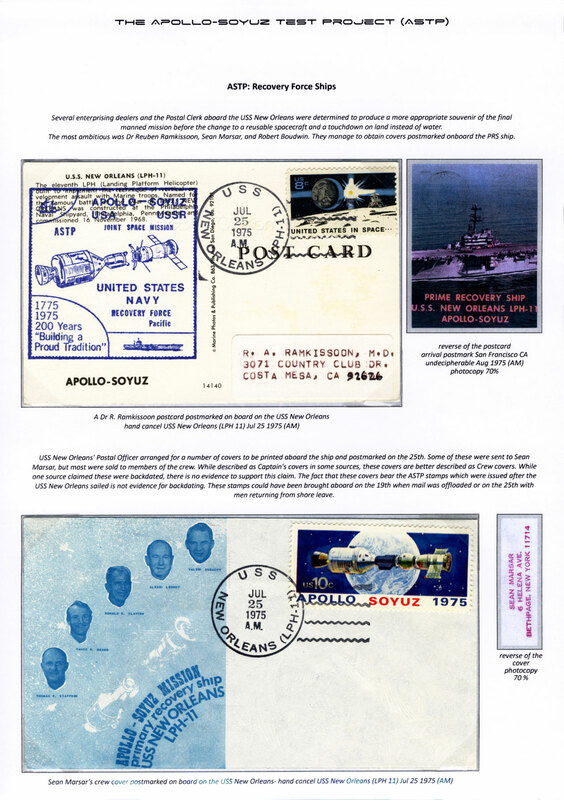 Postal Service as ordinary mail from its original arrival at the U.S. exchange office, and is not given the usual processing that is expected from registered mail. 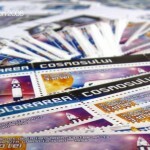 A post inspector has commented that any such registered mail items can be considered the same as having a “Steal Me” label on them. 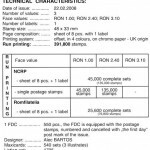 The applicable regulation, taken from the USPS International Mail Manual, says: 752.13 Treatment of Registered Items – All registered mail by the country origin must be handled domestic First-Class mail stream from the exchange office to the office of delivery. 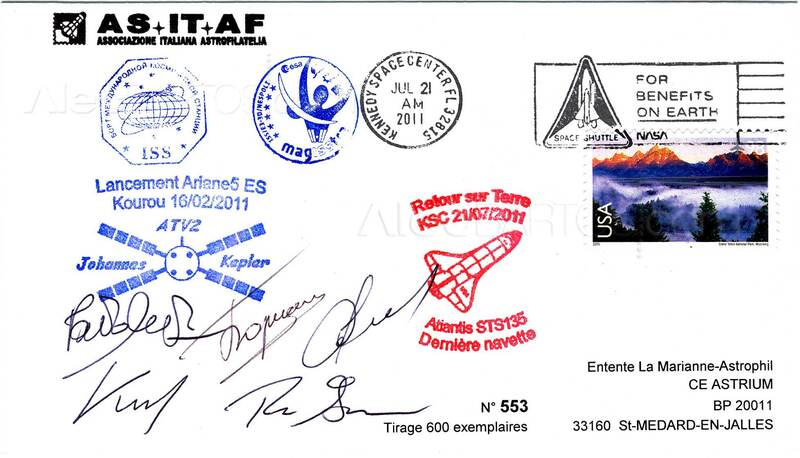 A signed delivery recipient must be obtained at the time of delivery. 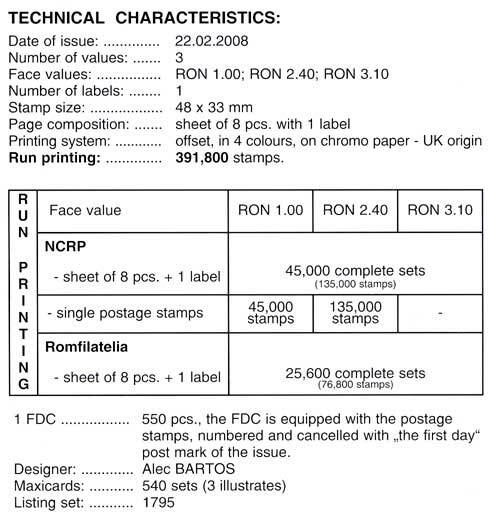 The second sentence show that simply because the recipient has to sign on delivery does not mean that the mail was given the secure handling expected of registered mail. 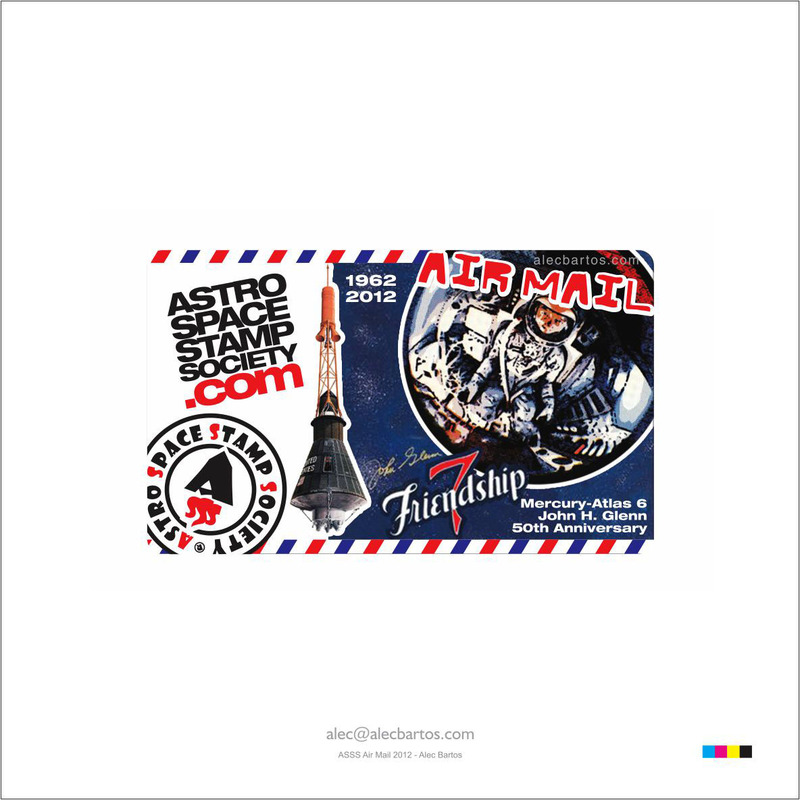 “Traveling in the domestic First Class Mail mailstream” means that the letter or package will be sent along with all other ordinary first class mail. 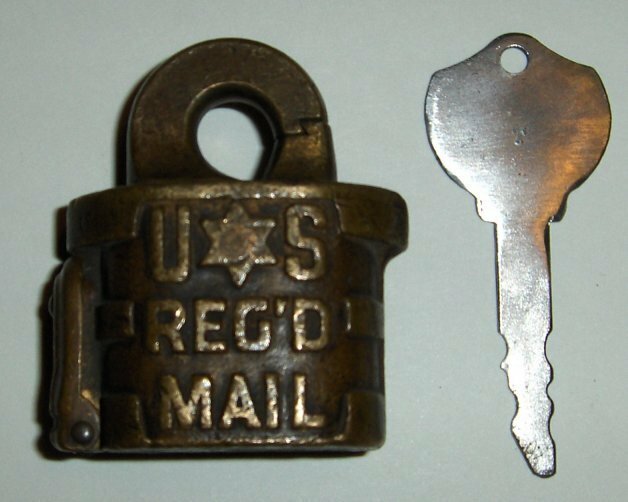 Registered mail within the U.S. remains the same secure process as before, as does registered mail send to overseas addresses. 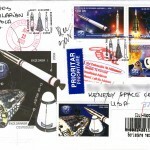 The danger is restricted to arriving mail. 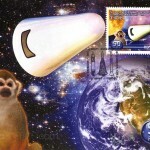 The best alternative is to use either Express Mail or Courier Services. 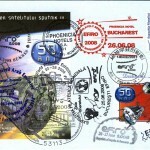 Be warned, and tell your overseas correspondents. 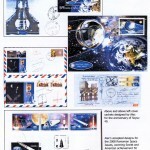 For high quality images I have uploaded large files, so please be patient until the full album is loading. 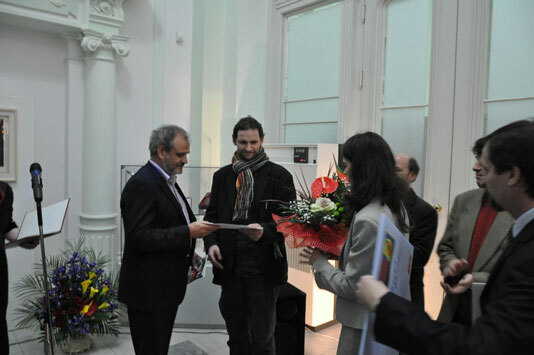 Bucharest, November 25th, 2010 – Compania Naţională Poşta Română organises on Monday, November 29th this year, a charitable cultural event during which 40 fine art works will be auctioned, selected from an art competition launched by the company under the High Patronage of the Ministry of Communications and Information Society. 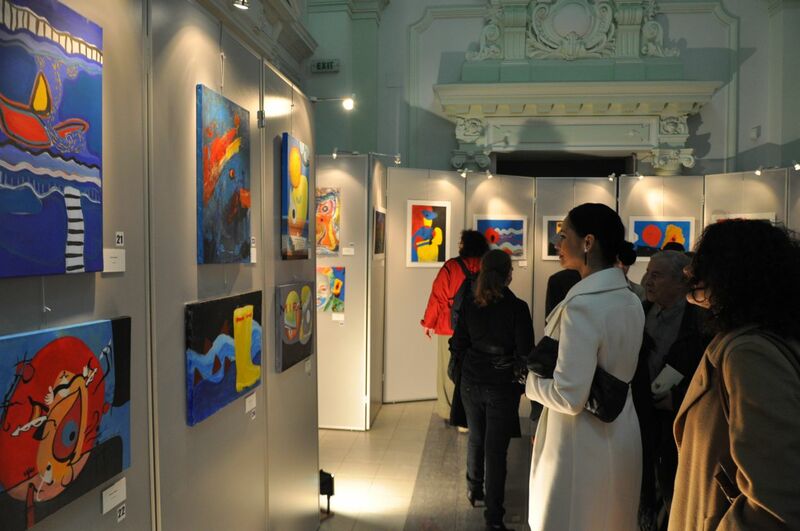 The event organized by Poşta Română will begin with the opening of an exhibition presenting the works of young artists participating in the painting contest “Art as a means of communication – in the footsteps of Joan Miro”. 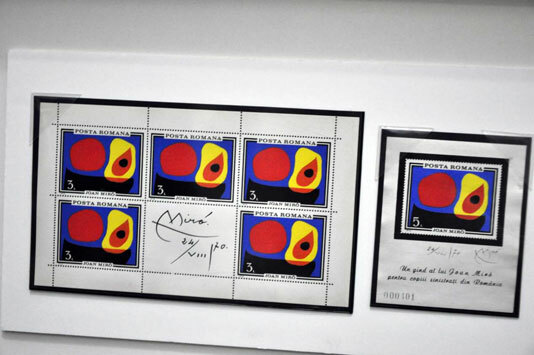 The exhibition was inspired by the work of the Spanish artist Joan Miro, “Flood II”, donated by the latter to the Romanian State and hosted by the National Philatelic Museum in Bucharest. 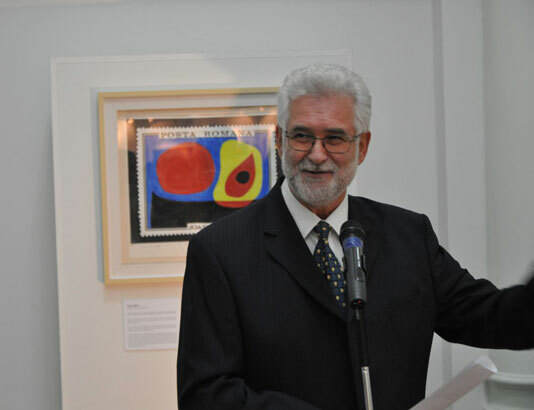 The opening will be followed by a charity auction supported by Goldart Auction House. 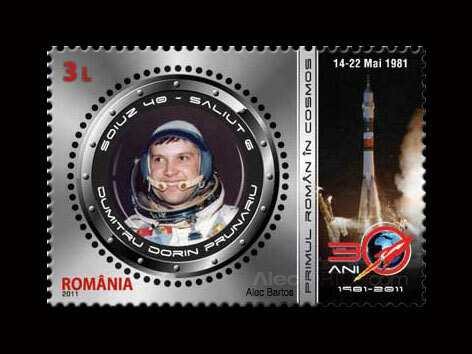 All the money raised on this occasion will be donated to UNICEF Romania for the rehabilitation of schools in areas affected by the flooding in June 2010. 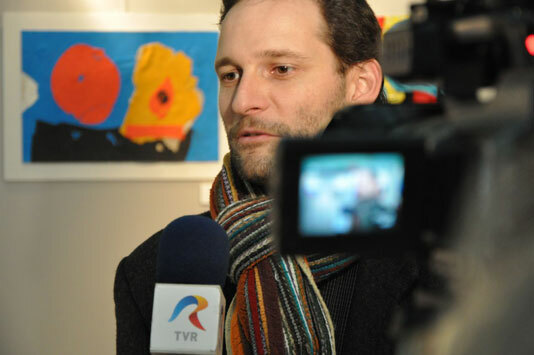 “By means of this initiative we want to be closer to disadvantaged communities affected by this year’s floods, but also to support arts and Romanian and international cultural values, to promote young artists and to create as much as we can a framework for asserting their value” said Daniel Neagoe, President and CEO of Compania Naţionala Poşta Română. 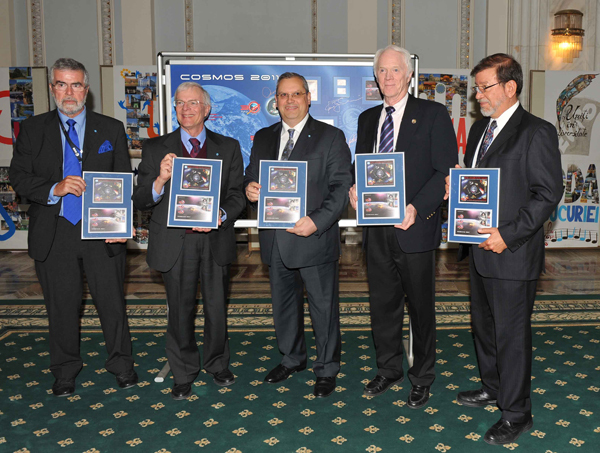 “We are extremely pleased to be partnering with Poşta Română and together we can put a smile on the faces of children affected by this summer’s flooding. 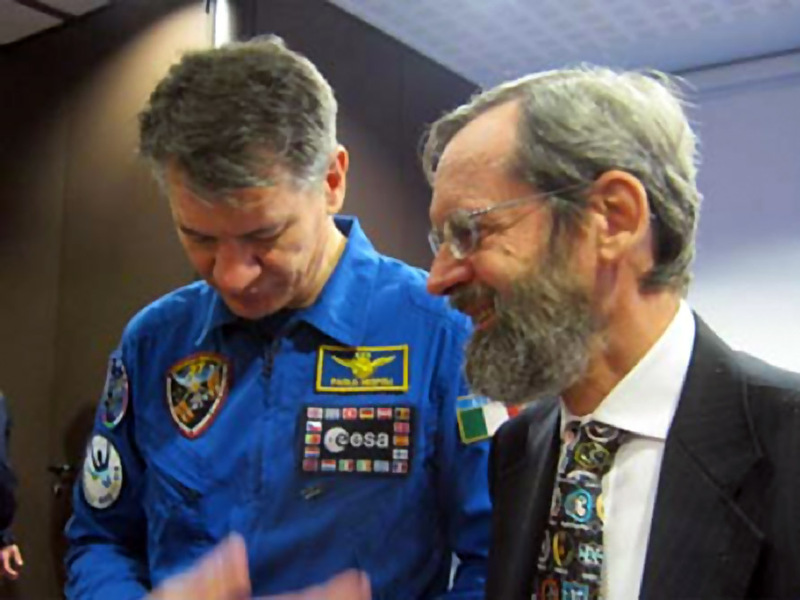 Even if the waters receded long ago, the children and their communities still need our help for their lives to get back to normal. 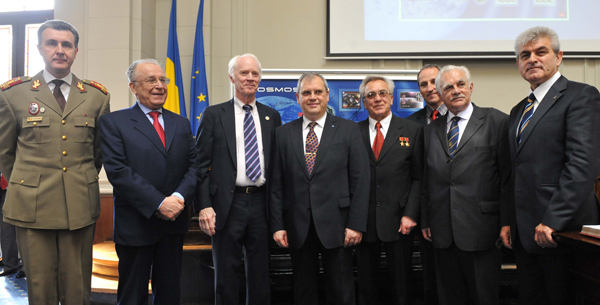 Together with the representatives of C.N. 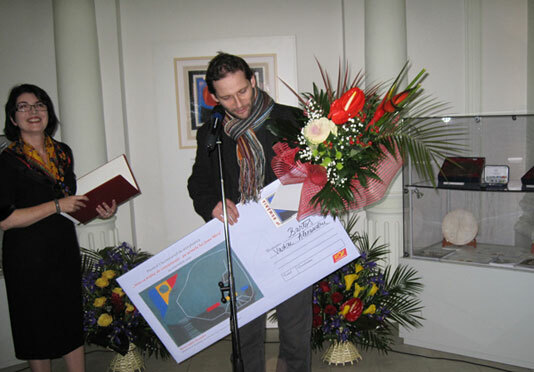 Poşta Română S.A. we have decided that the money raised from the auction be used for the rehabilitation of schools affected by this year’s floods and come in this way in support of children facing difficulties in the educational process and in danger of dropping out of school”, said Edmond McLoughney, UNICEF Romania Representative. 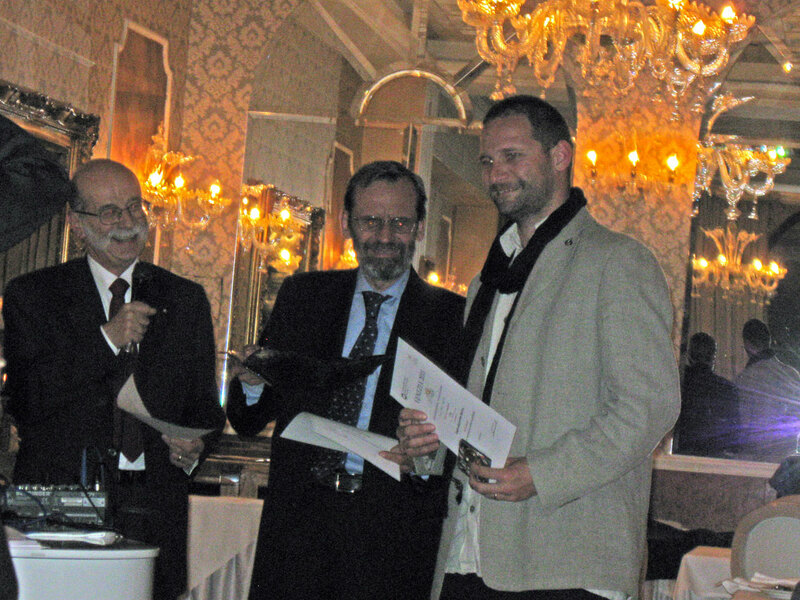 The event brought together C.N. 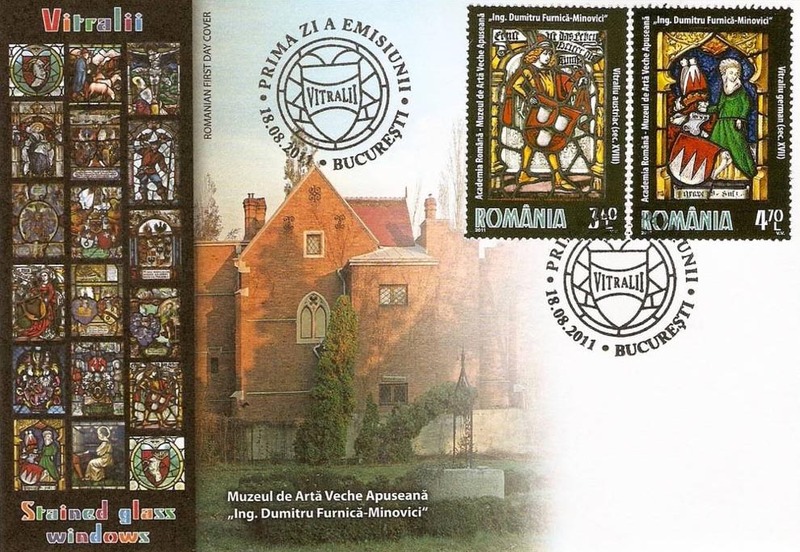 Poşta Română S.A., Goldart Auction House, the Romanian Professional Designer Association, the Artists Union, representatives of the National University of Arts in Bucharest and Romfilatelia.